You can waste an awful lot of time farting around for great occasions. Pete and Henriette carried on the social game . . .all the artists I’ve ever known did it, except maybe Edward Hopper. Please don’t interpret tonight’s post as a complaint–it isn’t. Over the past decades, I have sought this indefinable center between the public and private side of an artful life. I love living after the examples of the Thoreaus, the Hoppers and the Wyeths of the art and literary world, one steeped in creative solitude and contemplation. Winters are especially wonderful for that (especially now that my furnace is repaired, after six days of frigid living!). But I also ache for that creative collaboration among kindred spirits. I love the cafes, the salons, the gatherings of inquisitive minds who feed off one another’s inspirations. Tonight I am headed for the latter, a monthly salon gathering that I enjoy to the depths. What I wish is that I could return to my studio and work on some art pieces after the meeting, because a number of ideas have been percolating with me over the past several days and I just cannot seem to catch a break to pursue them in solitude. Part of my teaching load this semester is an online college course and tonight I have promised myself that all assignments submitted over this past week will be graded before I retire to bed–the students deserve that. And so, perhaps tomorrow I will get back into the studio. Tonight I can only salute those artists that managed to balance their solitude with their society. I am just as much charmed by Thoreau’s Walden cabin as I am Picasso’s Parisian Cafe Gerbois. The former looked into the face of nature and drew unlimited resources; the latter listened to the poets, artists and philosophers in the cafe around him and transformed their ideas into art. I blog to remind myself that I am never alone. After the morning plein air excursion into Granbury, I next turned my Jeep further south, and arrived in Hico, Texas as the sun waxed hotter. What a fabulous town for painting! Ghost signs were everywhere to be found on the sides of buildings of brick and rusticated stone. I turned down a major street, and was delighted to find it divided, with a tree-shaded island featuring park benches and gazebos. I found plenty of space to set up my easel on the island, without blocking sidewalk traffic (not that there was much, in that small town!). As I painted, I found the residents of Hico to be exceedingly friendly. A number of men and women approached me, looked at my work, said affirming things, and chatted with me about life in the small town, and also asked how things were in my large city, and I found it pleasing to cover a number of conversational subjects with them, all of the talk pleasant. I even had the pleasure of meeting an acrylic studio painter who owned a business on the street where I painted. A lady in a passing car rolled down her window, took a look at my work, and expressed admiration for my attempt at architecture. She was a painter of animals and thought it would be difficult to paint buildings. I guess I should have mentioned to her that I find it difficult, painting animals! I loved this street intersection vista. The light rusticated stone building contrasted nicely with the darker buildings across the street on the left, and I was fascinated with the tree on the right invading the compositional space. I took a reference photo of this site and am seriously considering taking another shot at this in the studio. The day was hot, the travel exhausting, but I’m glad I got out and did this. Last night I looked at the website of the Weiler House Gallery (http://www.weilerhousefineart.com/#events) and saw that my Solo Show for this fall has been posted. My first reaction was that it was time to “find another gear” in producing art work. Showtime is in two months. 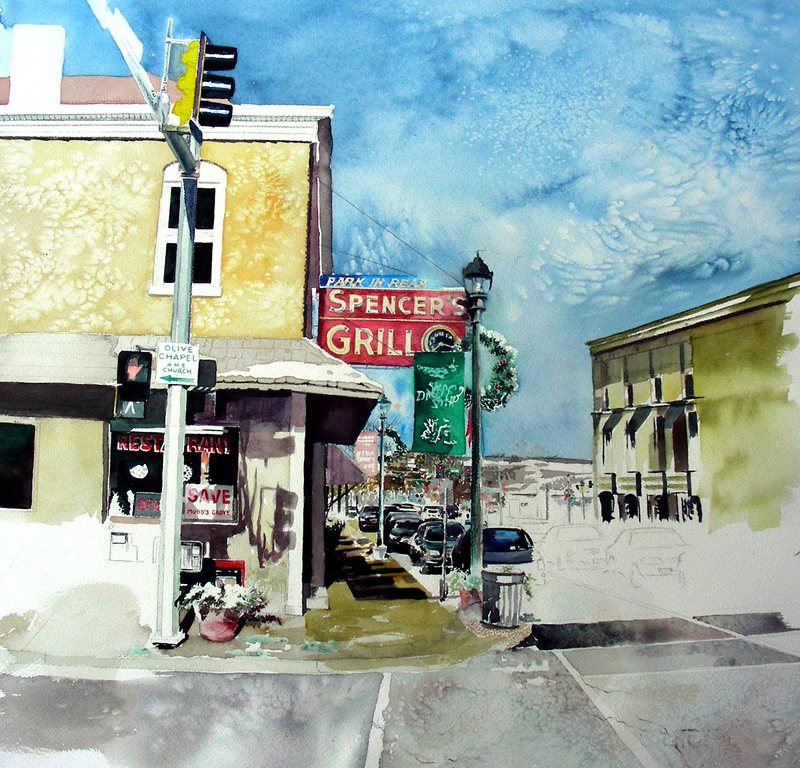 Today marks the end of the plein air competition in Waxahachie (for me). The deadline for entering work is tomorrow (Friday) at 2:00, and I will be stuck in school for the entire day. The last week of public school is a total waste of time and resources, if I may offer my frank opinion. Prime time every day this week has been spent in a high school where everyone–student and teacher alike–has already mailed it in. I’m happy that I managed to crank out seven paintings since last Friday–six of them between Friday and Monday, and then the past three days on this one (again, prime time spent in school, and left-over, late-afternoon time, painting). 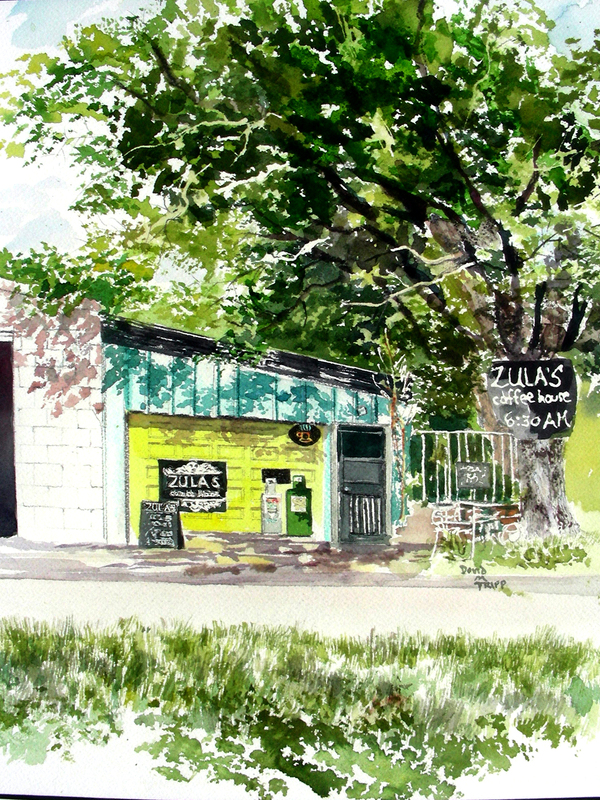 Zula’s Coffee House is my favorite place to land when I’m in Waxahachie, Texas. Terra, the proprietor, has this way of making any patron comfortable and grateful for setting up in this coffee haven, any time day or night. It has become a popular venue for folk singing, book discussions and various other small group activities. Wi-Fi makes it a great place to work on the laptop when deadlines are pressing. The coffee house is located on Business Highway 287, on the north side of downtown Waxahachie (Main Street). It is far enough away from the town square to escape the traffic noises of midday, and has a life of its own (which the town square lacks after 5:00 p.m.). The open meadow across the street provides plenty of space for anyone with an active eye and a dreamy imagination. During the fall of last year, I painted the meadow in all the bright colors that the late afternoon sun yielded. Again, this is a sweet spot to land for anyone who is a lover of art, books, music and of course, coffee! Thanks Terra for a very rewarding three days. I’m glad I finally got around to painting this splendid venue. I just got my painting framed at the Weiler House Gallery (http://weilerhousefineart.com) and will soon deliver it to the Eureka Springs School of the Arts for their first faculty art show. 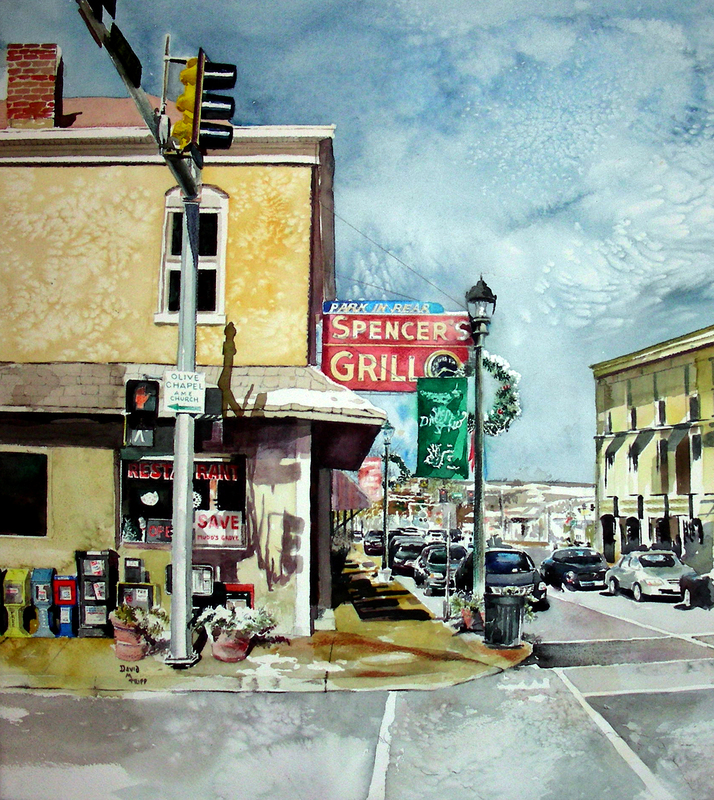 I haven’t seen the town since I left it last June, when I was privileged to teach a one-week plein air watercolor class to an outstanding group of painters. I’m glad the painting is finally framed, and that I am at the beginning of a one-week Spring Break from school. 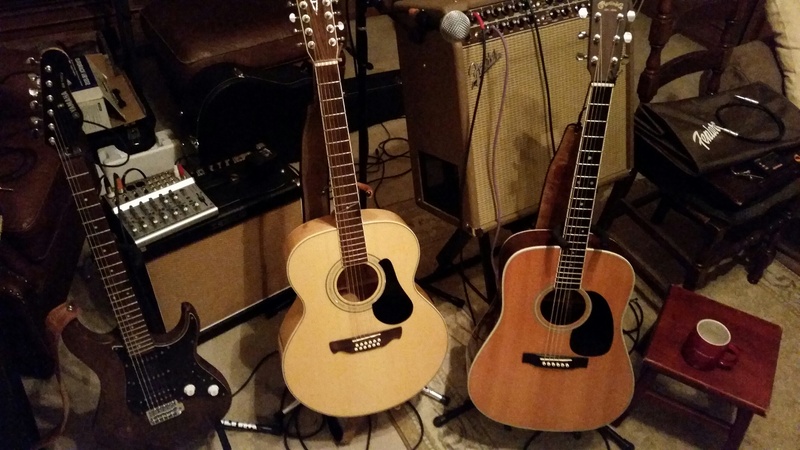 Already I’m in the garage planing out my next composition, and hopefully will have it posted soon. A Shout Out to the little town of Prairie du Rocher, Illinois! I am posting a watercolor that I completed in 1999, the first completed watercolor from my intensified quest to become a “professional” watercolorist, rather than a novice or Sunday Painter type. The actual setting is a composite of three places I had visited throughout my life. The Switzer building I always knew from downtown St. Louis, near where I grew up (sadly that building/landmark has since been torn down). The buildings on the left margin came from New Bern, North Carolina, a town I visited only one time in the mid-1990’s, and actually used the interior of a coffee shop there (the Trent River Coffee Company) to compose a mural at Arlington Martin High School (that mural can be viewed under the “Murals” tab of my website http://www.recollections54.com). 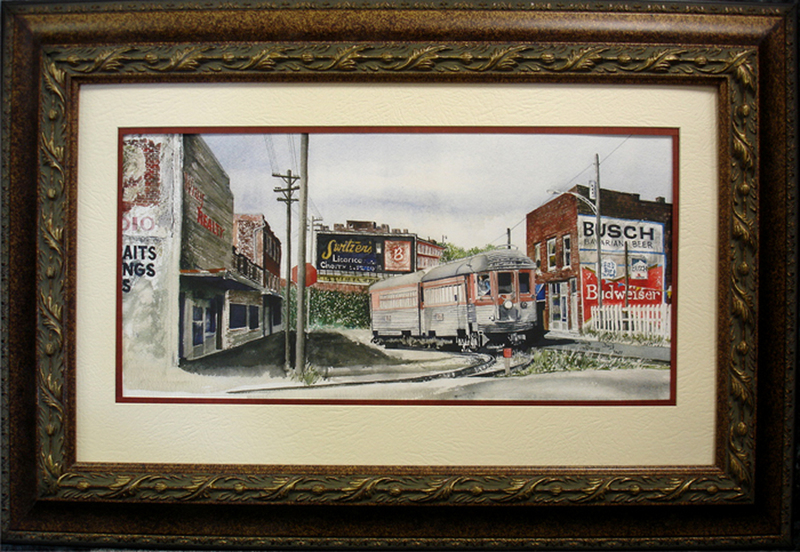 The building on the right, with the Budweiser and Busch ghost signs, I only knew as coming from a town in Illinois. I scoured a number of those towns very early in the 1990’s with my father, but did not take good notes in my journal. Since 1999, I have been unable to tell people specifically where I found that striking building to anchor the right side of this composition. All of that changed at Open House last Monday night. Parents of one of my A. P. Art History students were visiting with me, and as we shared our backgrounds, it was established that the father had grown up in Prairie du Rocher, Illinois, near Fort de Chartes. I recognized those names immediately as two of the places I had scouted with my father during that summer excursion in the early ’90s. I told this gentleman about my painting titled “Turvey’s Corner,” explaining that one of the buildings came from a small Illinois town in his general area. 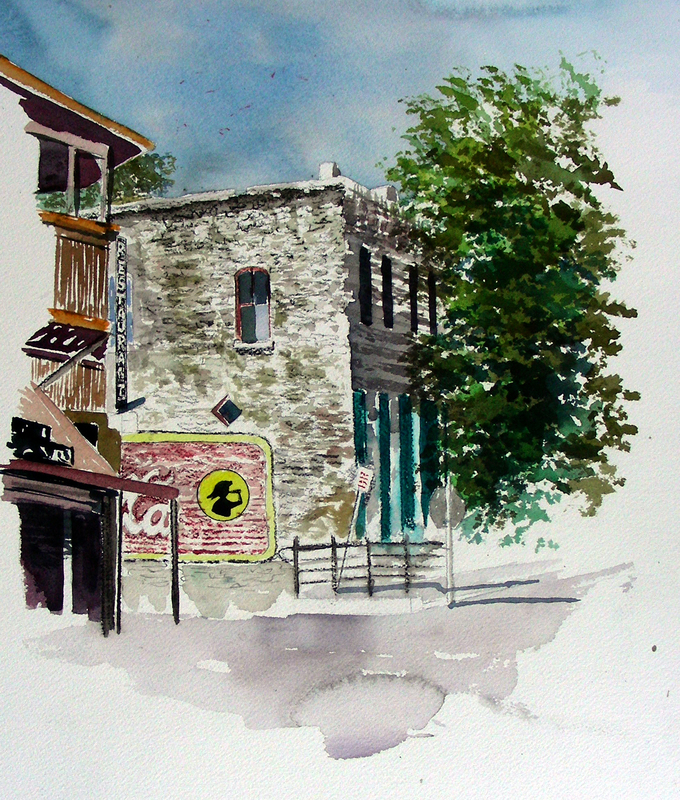 Today I received the surprise email from him, informing me that he had looked up my painting on the website and immediately recognized this “phantom” building as Lisa’s Market Street Grille in downtown Prairie du Rocher! Thank you, Mike and Karen, for providing this information for me. Trying to unwind and get to sleep. 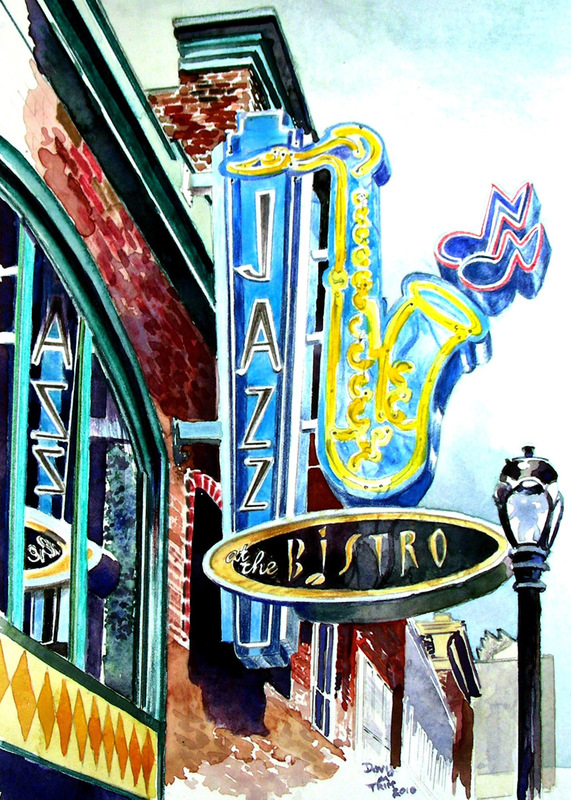 Earlier today I posted the Red Goose Shoes sign from a low angle, reflected in a store front window, and just now recalled this low-angle Jazz sign I painted last year with a reflection off the window. This marks the first time I ever tried to paint a window reflection. This original watercolor, unfortunately, was either lost or stolen last summer. The organization that had possession of it made good and paid me the listed price of the painting, and fortunately I had images of it to make limited edition giclee prints. But it always sickens me to have an original piece come up missing like this. It’s very likely that I could finish the Red Goose Shoes painting tomorrow. I’m ready to move on to another composition. Red Goose gave me headaches, with all the detail called forth. I’m ready for something looser and more atmospheric. We’ll see what transpires. The good news today was that the aunts are going to be just fine. After only 4 1/2 hours sleep last night, I decided I needed to nap this afternoon if I had any hopes of finishing this painting today. I’m glad I did. Sleeping from 2:00 until 4:00, I rose and resumed work on this in the garage (my Man-Cave!) with a beautiful afternoon Texas sun shining in the open door. The light was exquisite for working on this painting. Once it got dark, the winter temperatures plummeted, and I was forced to lower the door and continue work under house lights (I hate that!). But . . . I did not want to tinker with this another day. So . . . here it is . . . signed and out of my hands! Tomorrow I plan to take it to the Weiler House Fine Arts Gallery (http://www.weilerhousefineart.com/#home). I already have my next watercolor composition lined up, and I just may get after it tonight–I’m in the mood. Thanks for reading. Hope you enjoy this one. At last, the weekend! Immediately after school, I had a nice visit with my gallery director, Bill Ryan, at the Weiler House Fine Art Gallery (http://www.weilerhousefineart.com/#home). 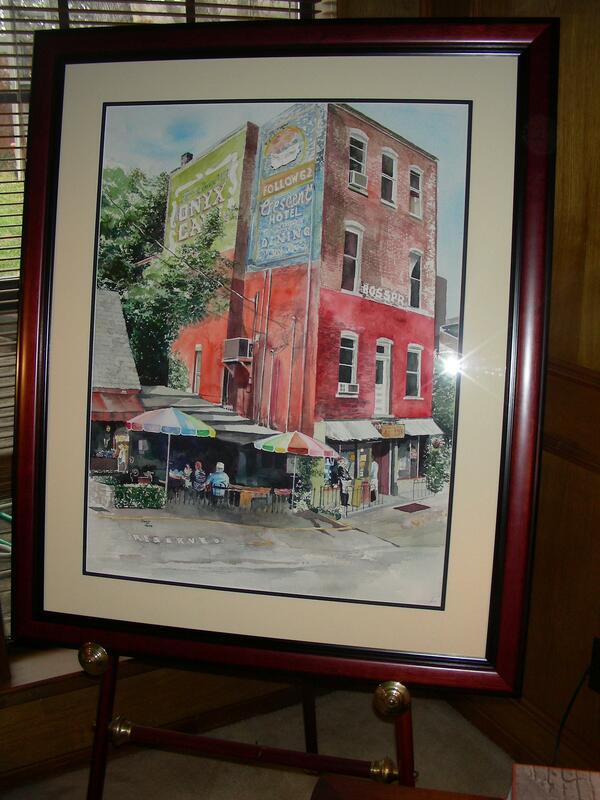 I dropped off my large Eureka Springs cafe painting for framing. Then, I dashed over to Texas Wesleyan University (my night job!) to retrieve some materials from the library. 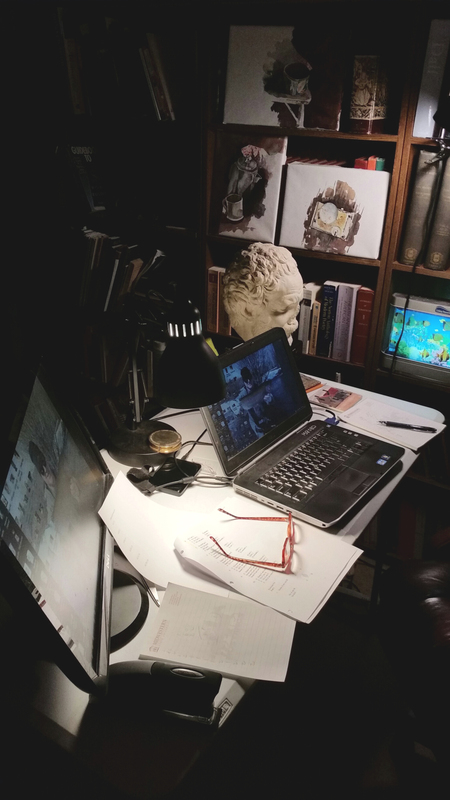 In my garage studio, I’ve enjoyed immensely the Voices and Visions series of video documentaries on American poets. Over the past week, I’ve listened to T. S. Eliot, Ezra Pound, William Carlos Williams and today am listening to Walt Whitman. I also picked up the Autobiography of William Carlos Williams, two volumes of his poetry, and the Cantos of Ezra Pound. I have before me a weekend of books and painting! If you’ve been following my blog, you will see that I have sketched in the pavement along the bottom of the composition, using a series of washes along with plenty of salt and water-soluble graphite pencil work. I’m now waiting for all of that to dry so I can get back to work on the cars and the newspaper vending machines along the front side of this diner. I fully intend to finish this piece over the weekend. Thanks for reading. I’ll get back to you soon. 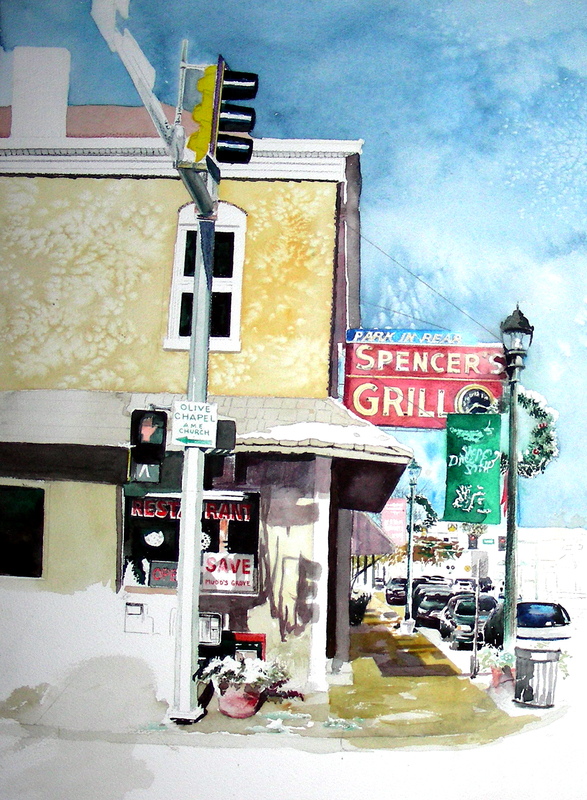 Though it’s been two months since I left St. Louis, my heart still stirs at the memory of a bright winter morning at Spencer’s Grill in Kirkwood, Missouri along historic Route 66. My wife and I had just ducked inside this historic cafe from the late 1940’s for breakfast of fried eggs, bacon, scrapple and coffee. This historic sign at Spencer’s Grill I had seen since my pre-literate childhood, and will always remember, Proust-like, as a monument from my remote past. 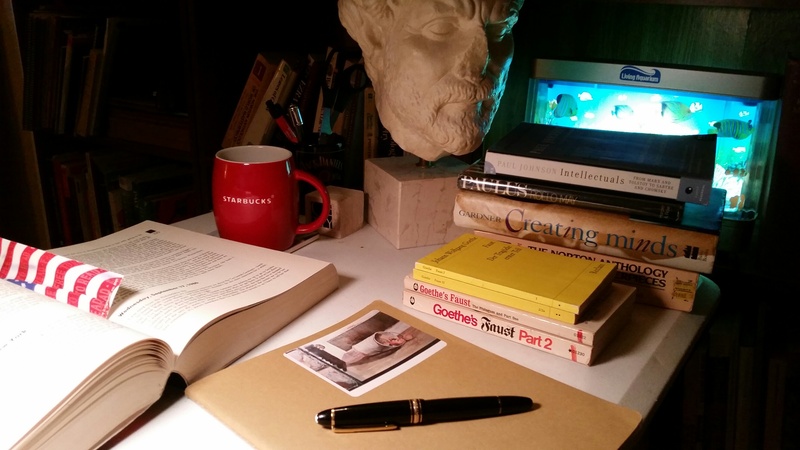 For over a decade, I’ve been fascinated with the Presocratic fragments, particularly the pieces from Heraclitus. I mused over this phenomena of traffic perennially rushing north-south on Kirkwood Road, while the ageless, changeless Spencer’s Grill remains. With my company Recollections 54 (www.recollections54.com) I try to capture in watercolor the images of an America from the 1950’s that remains in spite of the changes that nearly sweep the ground out from under us as we live out our fast-paced, deadline-driven lives.